On 22 May 1900 she was part of the crew of the yacht Lérina which won the first of the two regattas in the 1-2 ton class, and three days later the same crew placed second in the second race of that class. This made her the first woman to compete at the Olympics and the first female Olympic medalist. She was born Helen Barbey, to parents Henry Barbey and Mary Lorillard Barbey – the latter from a very wealthy family, in which Pierre Lorillard had founded a tobacco empire. Her father was an affluent banker. In 1891, in the American church of Saint-Trinité in Paris, she married Hermann Alexandre, Count de Pourtalès, the son of Alexandre and Augusta Saladin, from an old Huguenot family. He was a captain in the Cuirassiers de la Garde regiment in the Prussian Army. They had three daughters. She inherited a passion for horses from her mother’s side of the family (Pierre Lorillard was the first American owner to win the British Derby in 1881, with the horse Iroquois), and a love for sailing. The Lorillards were central figures in the Newport community, where America’s Cup regattas were held in that era. In one of her diaries, later sold by auction, Hélène provides a vivid description of watching the 1887 America’s Cup. 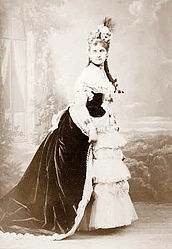 Hélène de Pourtalès lived in Paris and Géneve, and in 1900, she watched the Olympic golf tournament, in which her husband’s cousin Jacques was a course referee. Hélène had a dual passport, Swiss and American, while her husband had dual Swiss-German nationality.